A couple of years ago I went ski touring with my Czech friend Gabriel. I had never done this before. The picture is of one of the many climbs. Visible is Gabriel and four of the group of six French people we ended up shadowing. This day was started in a blizzard. As we gained height it thinned out, hence the nice effect of the hazy sun breaking through the snowy air. “Ski touring” is not an accurate description. 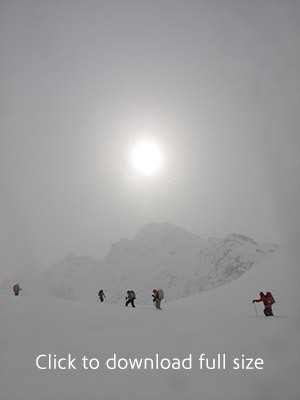 97% of the time you are trudging for hours up hills -well mountains actually- with skis attached to your feet. And carrying a backpack with everything you need for a fortnight in it. Through deep snow. In whatever conditions the winter and the altitude care to deliver. Avalanches and crevasses claim a few souls for the snow gods every year no matter how careful you are. I am sitting here gazing out on a beautiful spring day. The trouble is, I will not be able to enjoy it when I do get outside in a few minutes. Or at least I will not be able to UNLESS I CONTRIBUTE TO MY BLOG FOR THE FIRST TIME IN TWO YEARS…. so here we go. I am sure it is a common experience for many of us. Tasks, not onerous at all, stack up for lack of attention. Then a miasma of guilt and anxiety settles around them like a bad smell. What was once a stimulating little project becomes stale and a burden. This blog is a prime example. I love writing, so why haven’t i done it? My psychotherapist sister-in-law describes this experience as like the invisible hands on the steering wheel. You set out in one direction and for no apparent reason you end up on a ninety degree tangent. It all sounds a bit far fetched. However I can -and will- elucidate. Not now though: the sun is shining and I intend to get out and enjoy it.